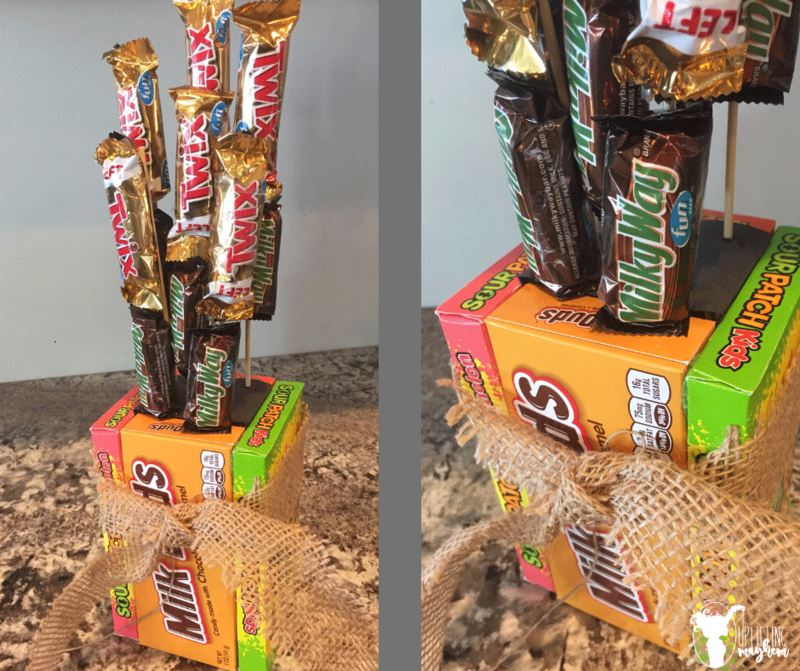 This post is to show you how easy it is to make your own Twix Candy Bouquet, or any kind of candy bar bouquet. I like to do a mixture of candy bars, but really the sky is the limit! My husband asked me to grab a gift for someone who has been helping us lately, so I went to the store and was flabbergasted (yes this is a word and yes it is spelled correctly :)) on how much candy bar bouquets were. The cheapest I found were $15 and the most expensive was close to $30! I decided to go to the candy isle and make my own and I’m so glad it did!! IT WAS SO EASY!! The great thing about this Twix candy bouquet is that it doesn’t cost you $20 and you can pick and choose what you put in it. This cost me $7, but I already had skewer sticks and the ribbon. 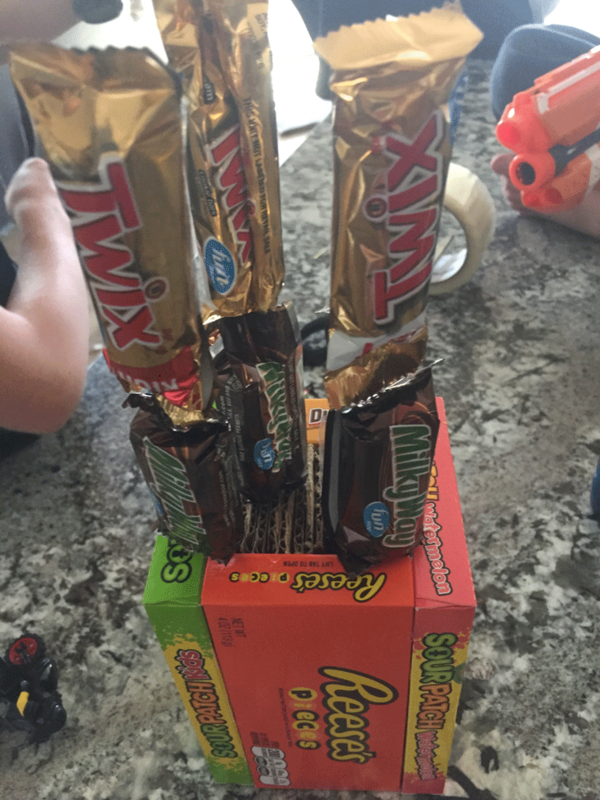 Step #2 – Glue your 4 boxes into a rectangle so it creates a candy vase. 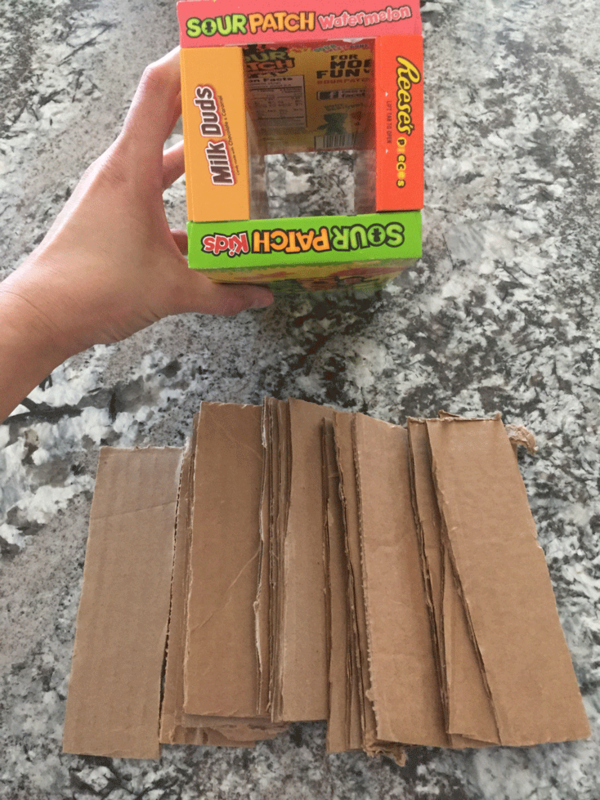 Make sure that when you are picking out the boxes that you have 2 different sizes. If you get more than 2 than you vase is going to be crazy shaped. 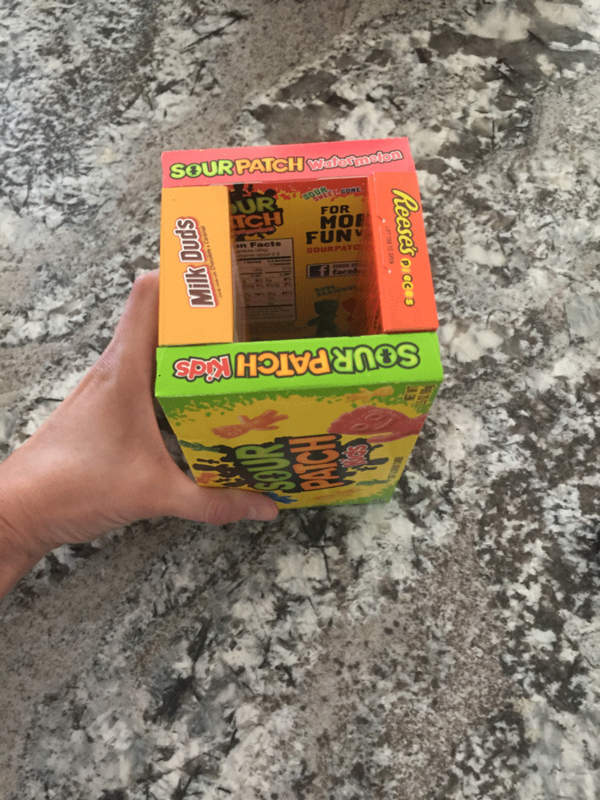 Also, make sure all of the boxes are facing outwards so you can see the candy name. This is what makes this so cute is that the candy is the vase. 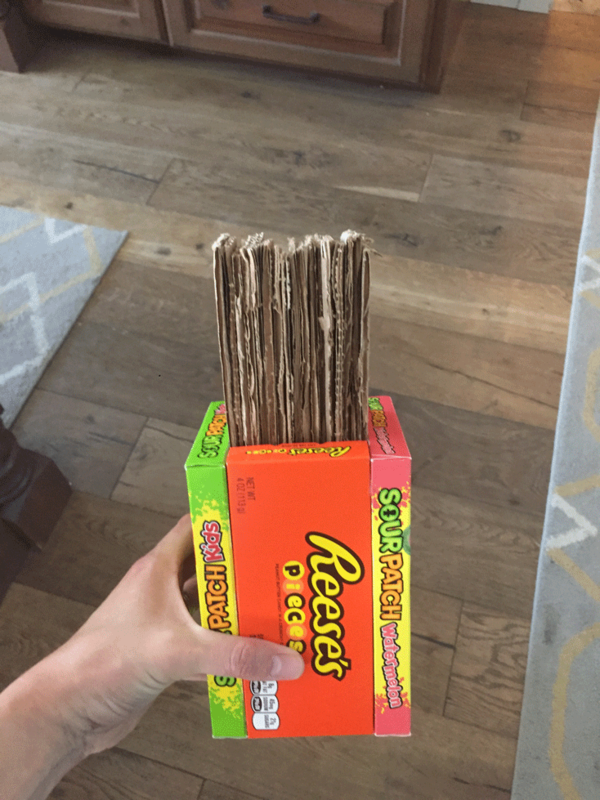 Step #3 – Cut up cardboard, or styrofoam so it fits inside of the candy vase. I used cardboard because it is what we had. It was easy and just used scissors to cut it up. Styrofoam would be easy as well, it is just another thing you have to get. 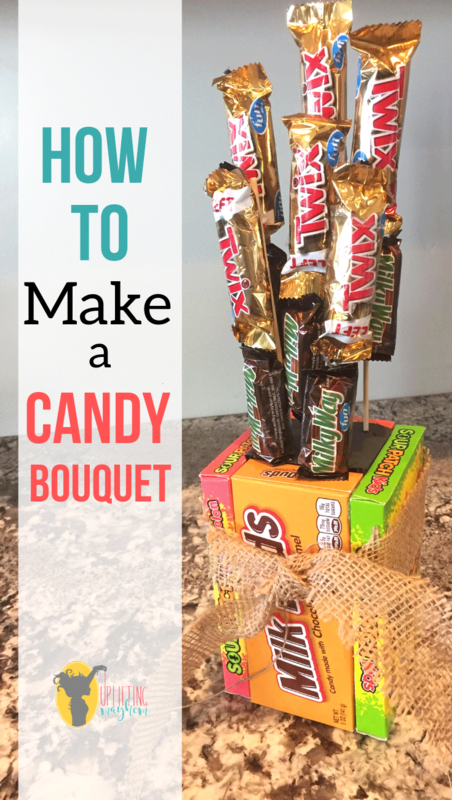 You could also glue a piece of cardboard on the bottom of the vase and fill it up with a candy as your filler. Like I said, this is open to a lot of different customizations to make your gift just right! 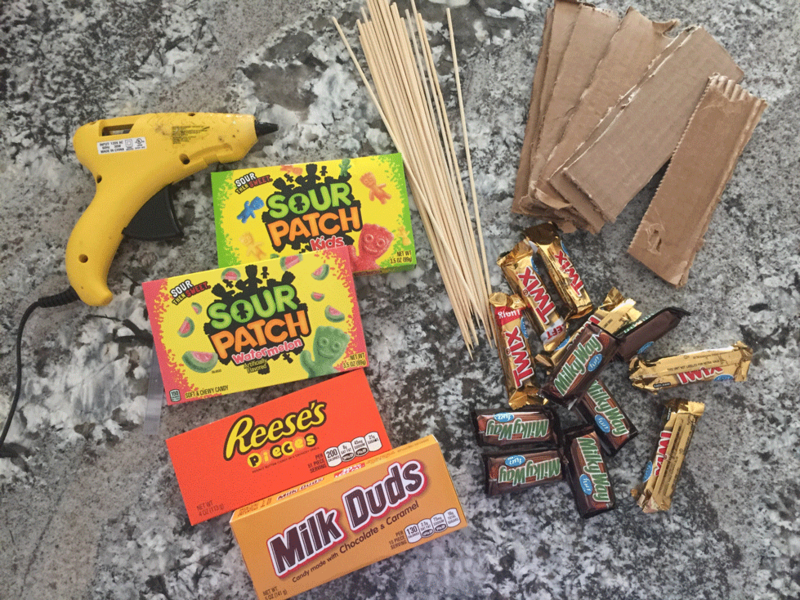 Step #4 – Tape the candy bars to the sticks. 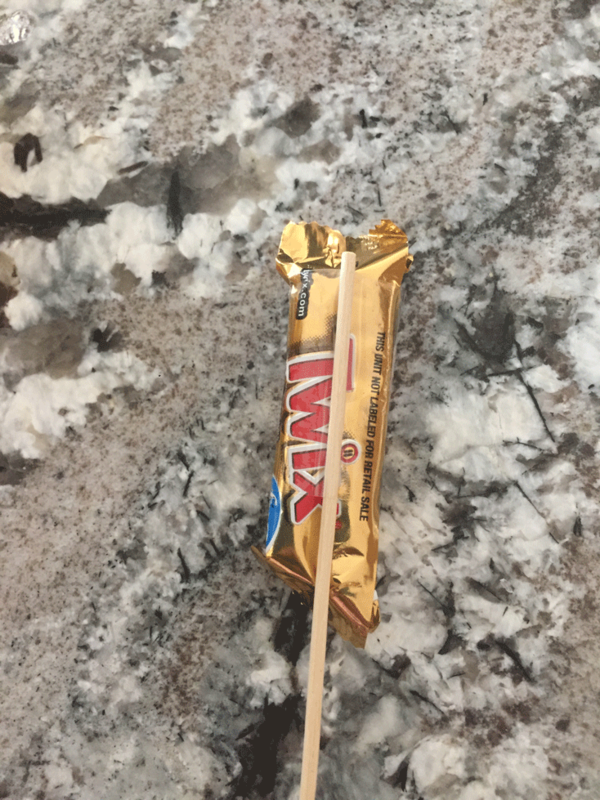 I taped 2 candy bars per stick. You can do whatever you want and color code how you want to. Arrange your sticks in a way that is decorative to your liking. It is that easy and you saved some money in the process! You could add little water balloons blown up and place them on a stick to add to the bouquet. That is it! 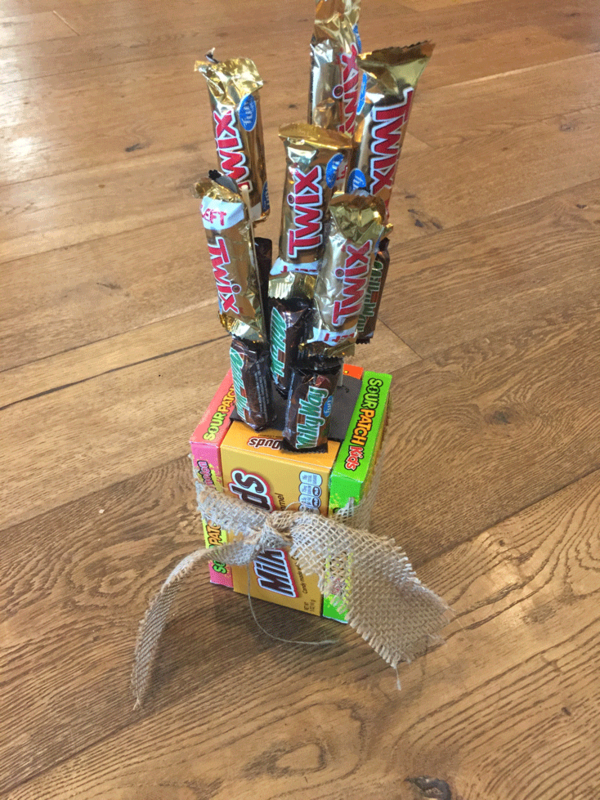 Your Twix candy bouquet for the next cute, gift you need. For gift ideas for those who are hard to buy for check out this post!